The old adage “prevention is better than the cure” rings true when it comes to protecting your property and loved ones. A CCTV system acts as an effective visual deterrent to any would-be burglars by its very presence alone, reducing the risk of you falling victim to crime in the first place, and with remote viewing capabilities, by investing in a CCTV system, business and family owners are provided with an increased sense of security and peace of mind. Protect your home with the NEW Yale Smart Living CCTV surveillance system. This DIY friendly system complete with Digital Video Recorder, cameras and cabling features built-in intelligent video analytics, enabling the system to detect and analyse moving objects from the CCTV cameras. Not only will the system record these events, but you will immediately be alerted via PUSH notifications sent to your mobile. Viewing live or recorded footage from the system can be done easily via a local screen connected to the DVR or remotely on a smartphone or tablet using the Yale Smart Living VIEW app. With enhanced night vision and an IP67 weatherproof rating, you’ll get crisp footage even in the lowest light or worst weather conditions. Plus, tailor the system to your needs by adding additional cameras.Our Smart Living products are fully controllable from our intuitive and customer friendly app. Download our Smart Living VIEW app on your Apple or Android device and enjoy the Smart Living security experience at no monthly cost! 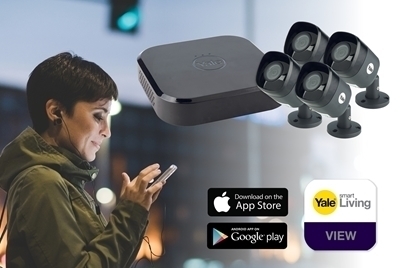 Being able to see what is happening at your home or business while you are not there has just been made even easier with Yale’s new Smart Home CCTV surveillance products and the Yale VIEW App. Available on both Android and iOS platforms, the Yale View App enables you to remotely view your Yale Smart Home CCTV system over the internet. In addition to being able to watch live feed on your smartphone or tablet, you can also access previously recorded footage from your surveillance products.